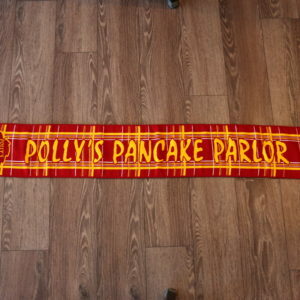 We make several cake rolls here at Polly’s. 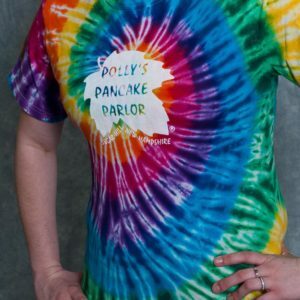 Our baker Sam decided to try her hand at making one from our pancake mix. She also wanted to feature the DELICIOUS maple buttercream she makes. 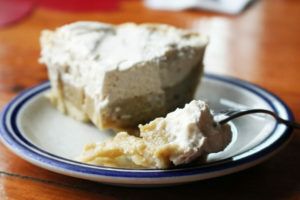 This is a sweet recipe, make no mistake, the maple flavor is strong with this one. Even a small piece feels indulgent and rich. 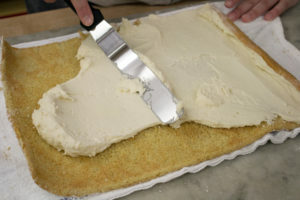 It has a delicate texture that compliments the smooth buttercream. 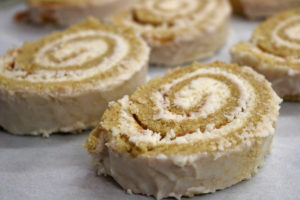 It does take a bit of time to make, but is a fun and adventurous take on a cake roll. Preheat oven to 350. 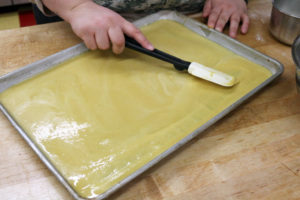 Prepare and 9×13 inch pan or baking sheet by placing a piece of parchment paper on the bottom, grease AND flour this parchment paper. Whisk eggs and vanilla until pale. 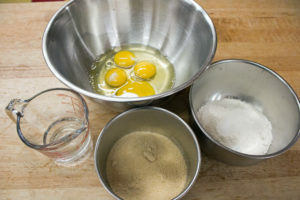 Add water and continue to whisk. 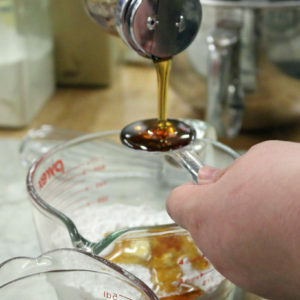 Gradually add maple sugar and whisk it in. 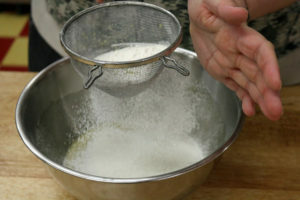 Sift together Pancake Mix, baking powder, and salt together. 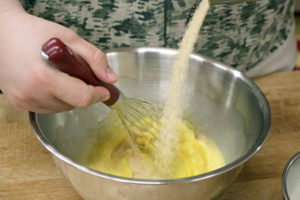 Add this to the eggs gradually and whisk to combine. Pour into prepared pan and evenly spread it out. It will be thin and seem loose. Bake for 10-15 minutes or until it springs back when you touch it. 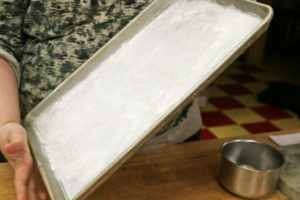 While the cake is baking prepare a towel with powdered sugar coating it. 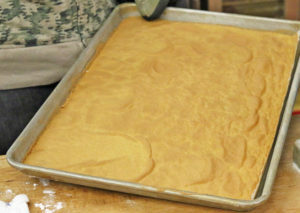 Once the cake is ready immediately flip it out of the pan onto the towel. 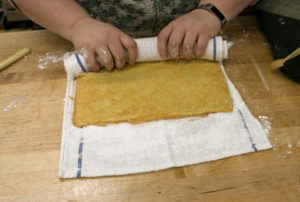 Carefully pull away the parchment paper. 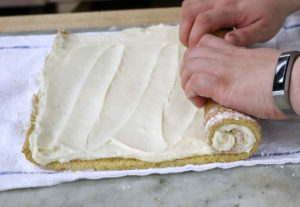 Roll the cake into its final shape, roll it up along the short edge and with the towel in it. Set aside and let it cool. 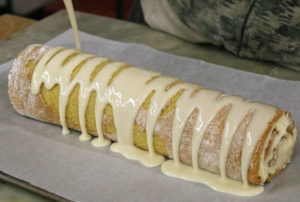 While that is cooling prepare your maple buttercream and maple glaze. 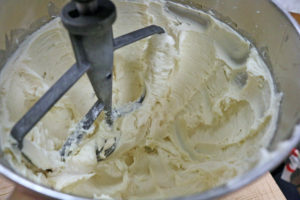 Using a stand or hand mixer cream butter, add sugar and milk. Whip until white and fluffy. Add syrup until well combined. If too thick, you can add more milk. Whisk together. 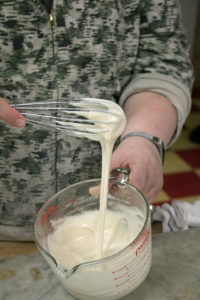 Add more milk for a thinner glaze- more sugar for a thicker one. Once your components are all made, make sure your cake is cool. 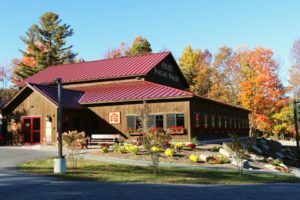 It should no longer be hot to the touch. Very, very, carefully and gently unroll. 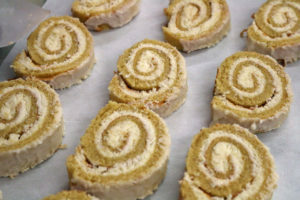 Fill with maple buttercream, spread gently. Roll back up (using the towel to help you make a tight roll). Place seam side down on a pan, or drying rack above a pan. Pour glaze over the top and set in freezer for about 30 minutes, or until the glaze as stiffened. remove from freezer and slice and serve. This is one of our most popular, and decadent desserts in the restaurant. 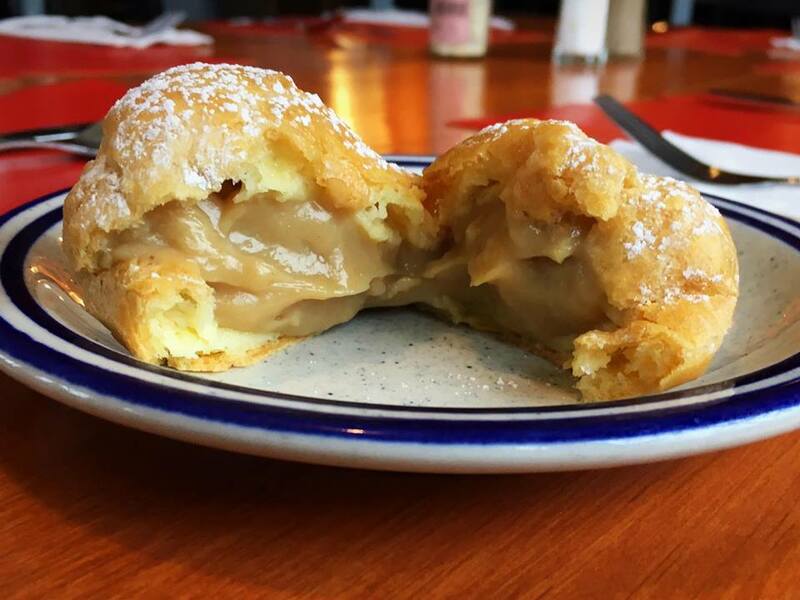 If you thought chocolate cream pie was rich, this blows that out of the water. 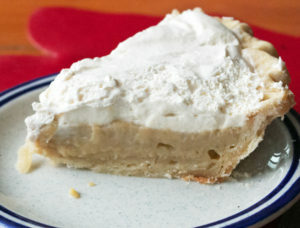 Its rich maple flavor and velvety texture make this pie feel like a real treat any time of year. Its very fast and easy to make, a great recipe to make with kids. 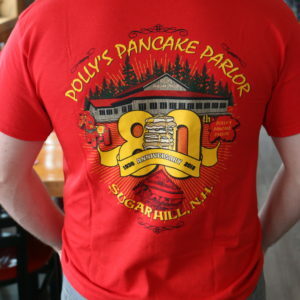 The taste reminds you of New England immediately and can take you back to NH with one bite. One of our bakers had a birthday. Since we didn’t think she should have to bake herself a cake- we decided to test this family recipe on her. 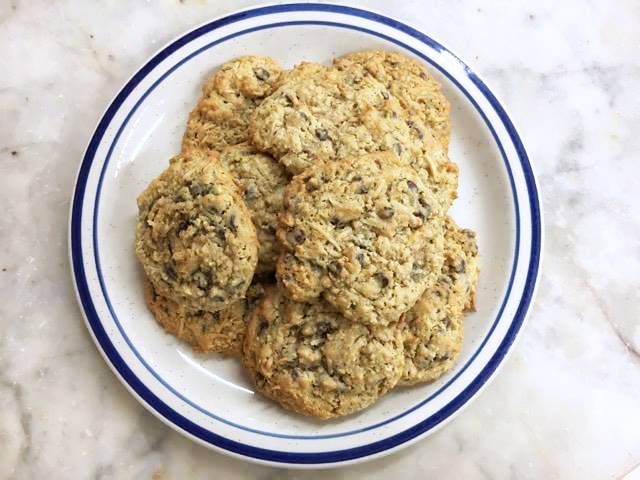 This recipe comes from Roger Aldrich’s Aunt Bea. 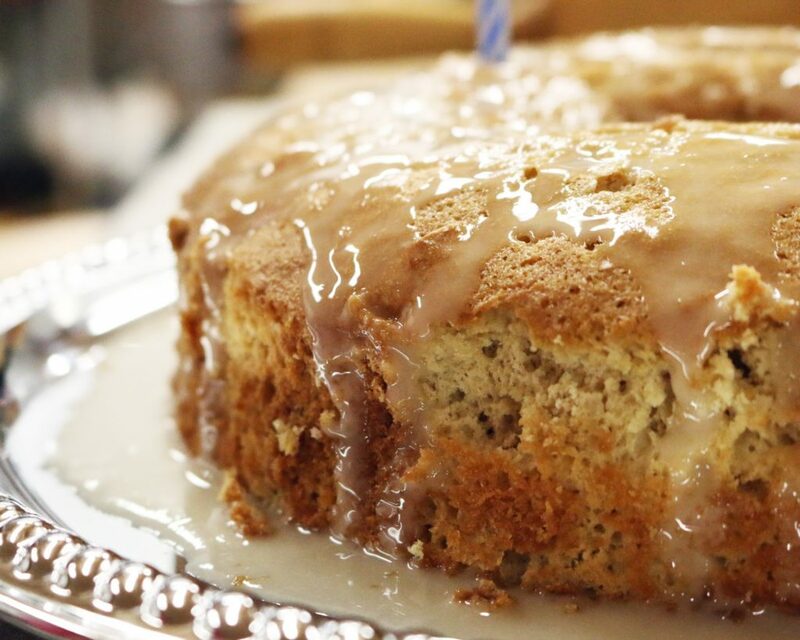 This Maple Sponge Cake is a sweet cake, but not overly so. It would go well as a light dessert with coffee after a dinner party, and if you have any left over, we don’t think anyone would judge you if you chose to have a slice for breakfast the next day too. 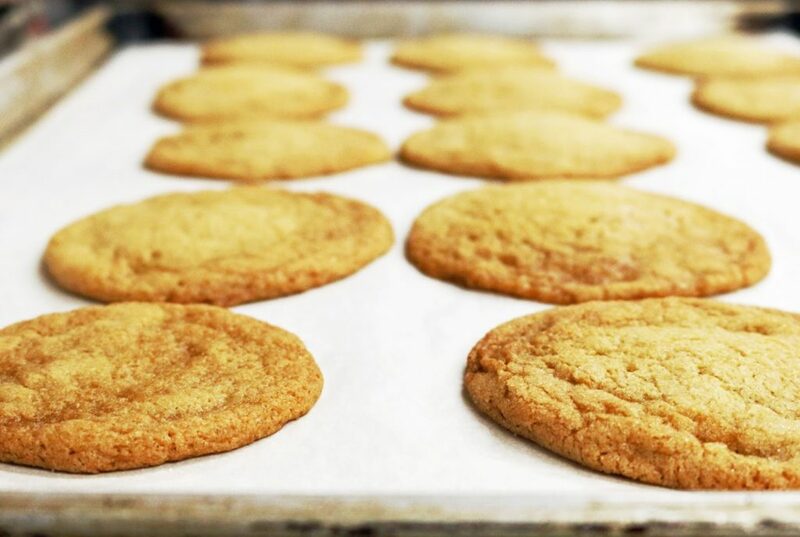 These maple sugar cookies have crispy edges, but soft centers. 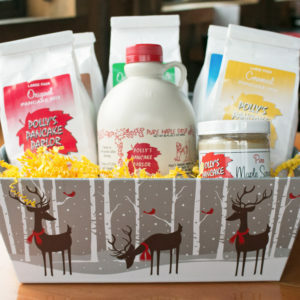 The brown edges bring out the maple flavor which makes this an interesting twist on a classic. This Beer Bread recipe is a very easy recipe. Incredibly easy! And tasty! And perfect for anytime of year! We’re obsessed now. 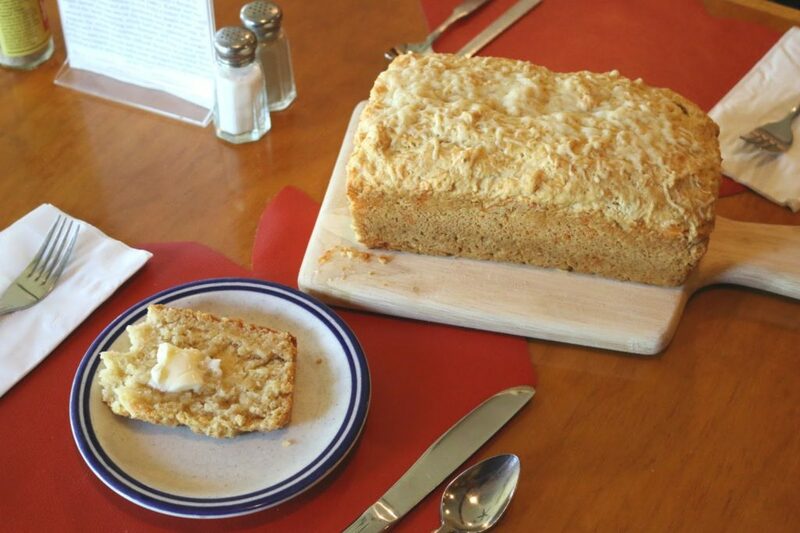 Beer bread is a perfect place to start if you’re just getting into baking- or if you’re an experienced baker who wants to make something quick and easy. This recipe uses our pancake mix as a base. While we list our recipe below, feel free to experiment by using different cheese, or adding herbs. If you like a kick, add some jalapeno, or try a really savory style and add some black pepper and Parmesan. It leaves you with a fluffy light bread that is very versatile. 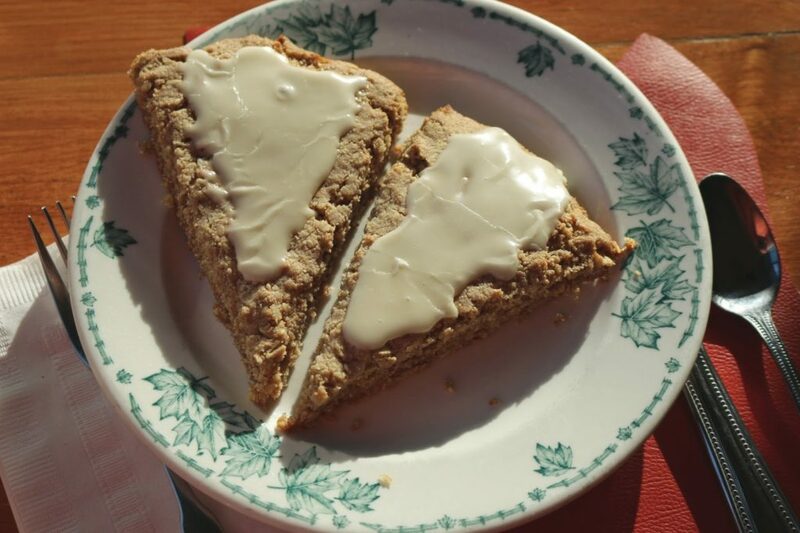 This is a recipe from our old maple recipe book. This was developed by “Mom” or “Grammy” Aldrich, Roger’s Grandmother. 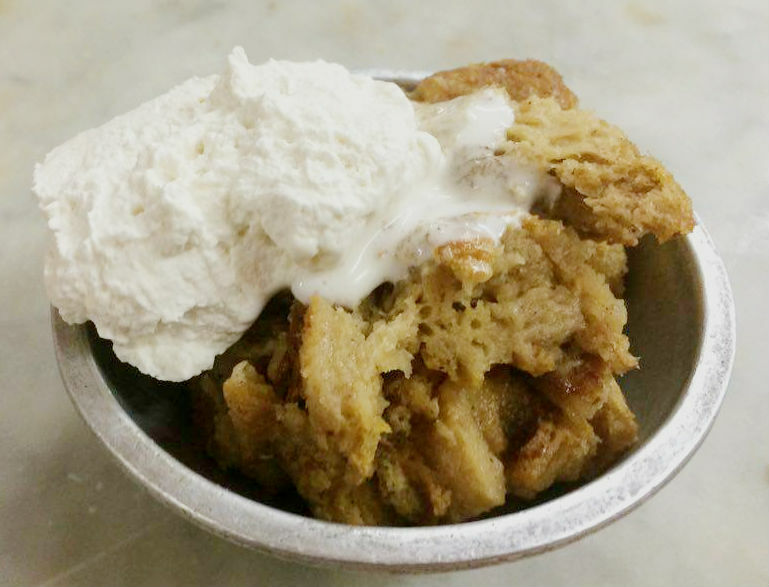 With the holidays right around the corner- we think its appropriate to share now (and being big fans of bread pudding it wasn’t so bad having to make some). 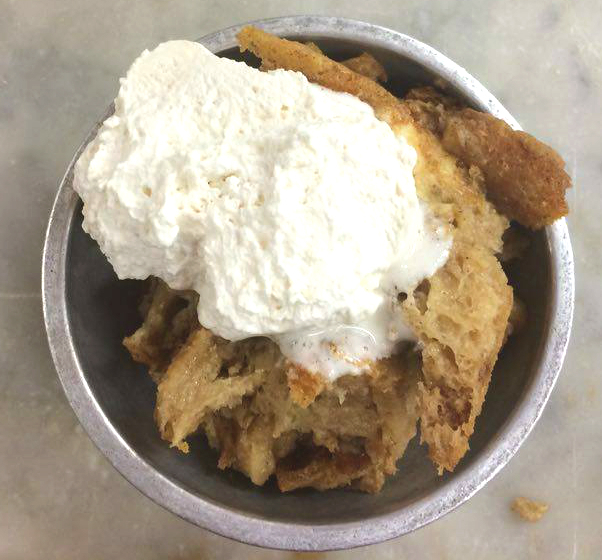 We’ve paired it with a maple whipped cream that’s very easy to make.